The Pantanal, is a puzzle of landscapes, reason existence of this unique great biodiversity, that makes the Pantanal main Sanctuary of wildlife of the South America. The Paraguay river, that borders in many moments points of granite mountains, represents the source of the plate river basin. 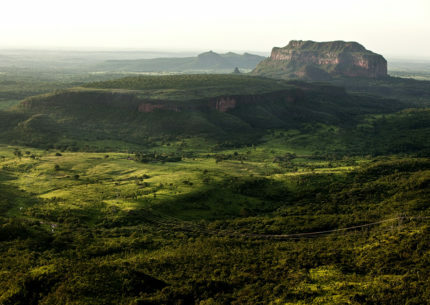 These granite hills are the farthest ripples of the Andes Mountain Chain, which dates 400 million years ago, unique scenario in the whole Pantanal. This program intends to take the visitor to explore this magnificent river with its stunning landscapes, at the vicinity of the Tayaman Ecological Reserve, well known as very rich in biodiversity with remarkable jaguar population very well preserved. Our presence in this region contributes to the conservation of this admirable specie, sacred symbol of many tribles In the Amazon. The combination of the Pantanal ecosystem, particularly Araras Eco Lodge reserve, and the Paraguay river region, comes together to the combination of the flora and fauna of wet and dry land. It is a must for those seeking to know many of the diversity of Pantanal. In these fields, the presence of the Giant anteater and the tapir, biggest mammals of South America and innumerous species of birds, compound an unforgettable combination. Meeting and greeting at Cuiaba airport. After a briefing of the trip, departure at 13h20 or 17h00, depending on your flight schedule. This transfer is divided into two different stages. The first is a journey on a paved road along farms and cattle ranches. After reaching Poconé – we take the Transpantaneira Park Road at km “0” (108 km / 67.1 mi. from Cuiaba). This is a park road at its best, allowing us to drive above the water level, watching the flora and fauna of the Pantanal ecosystem – a photo safari along 146 km of dirt road with several stops along the way for photos and information. Welcome drink on arrival and accommodation. Later, the guide will lead you into an introductory walk through the surroundings of the lodge, explaining our concepts and many conservation projects. Continue to the Great Egret Lookout, a 12 m / 39 ft. high observation tower. After dinner, night walk under the Southern Hemisphere sky. Reaching its banks, board a canoe and paddle down the river, exploring the forest that grows by the riverbanks and mangroves. Here lives a colony of “ariranhas” – giant river otters. With some luck, you may spot a family playing with their babies and teaching them how to swim and fish. Chance of fishing the elusive piranha, not an easy task, but fun. Enjoy a barbecue lunch under the shadow of the trees (*). Hammocks are slanged to enjoy a “siesta”. Early breakfast. At 07:00, departure to the Pantanal ecosystem, toward Cáceres (190 km on BR 070 paved road and 76 km on dirt road – approximately 5 hours). The Paraguay River, main river of Pantanal, touch in many places, huge granite hills, which offers splendid scenery to this region. The areas we will explore offers the special opportunity to view jaguars on rocks, beside to see them on white sand beaches and riverbanks. Those hills are the farthest ripples of the Andes Mountain Chain. The next days will be devoted to explore riverbanks, lakes and bays in search of the elusive Panthera-Onca or Jaguar, the 3rd largest wild cat, South Americas’ top predator. The only of the cats that bites strait into the skull of its pray. The area we are exploring is quite secluded, therefore unspoiled and practically EXCLUSIVE, as very few Eco tourist boats roam this region. Board our special river safari motor boat: very comfortable seats, with plenty of space to stretch, stand up or turn around, without bothering your travel partners nor bouncing the boat. 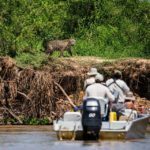 It is a very steady boat – allowing you to take very good photos of the wildlife you will meet –, equipped with a 115 HP silent and powerful outboard 4 strokes motor. After lunch, we do our first river safari, searching for jaguars and other wildlife. Return for dinner and overnight. Breakfast. Departure for a morning river-safari on motor boat along the banks, beaches, bays and channels of the Paraguay River. 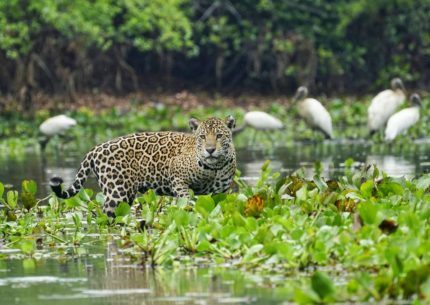 This region is a paradise for wildlife, and still little explored for ecotourism, so that our jaguar sightings are basically exclusive to our boats. We will be searching for capybaras and caimans sunbathing on the beaches, giant river otters playing in the water and jaguars’ roaming the river banks searching for prays. Return to the Lodge for lunch. In the afternoon, join another river safari, returning late afternoon for dinner and overnight. We will be exploring the region in the vicinity to the Taiaman Ecological Reserve with a dense jaguar population, close monitored by the environmental authorities. The chance of spotting the biggest feline in the Americas, although not guaranteed, is high. After breakfast, return to Cuiaba. Note: The order of activities may be modified according to weather or tourists interest. Araras team will do their best for that your stay in Pantanal becomes unforgettable. 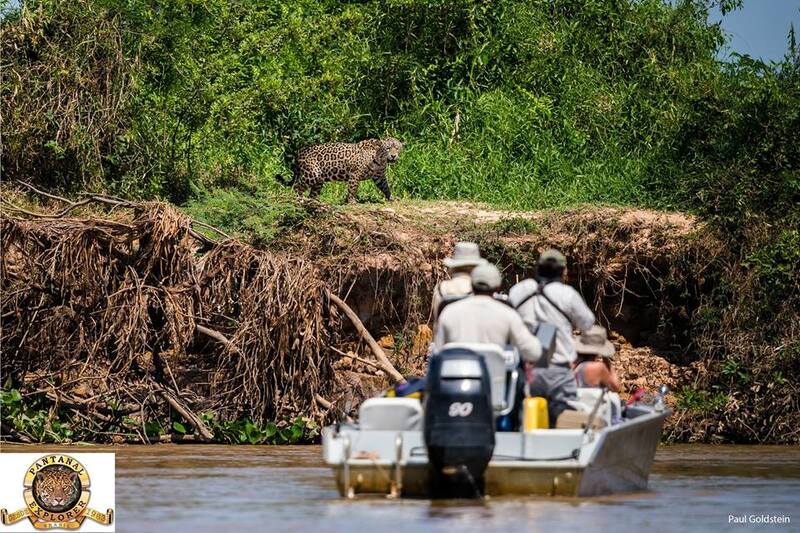 Regarding Baiazinha schedule, offering 5 half-day river-safaris, our boat pilots and guides will choose the itineraries to be followed according to sightings informations previously received, always looking to offer the best opportunities of meeting the jaguar and other wildlife.